A rock musical from 2001 that is well-loved by many Rocky Horror Picture Show fans. 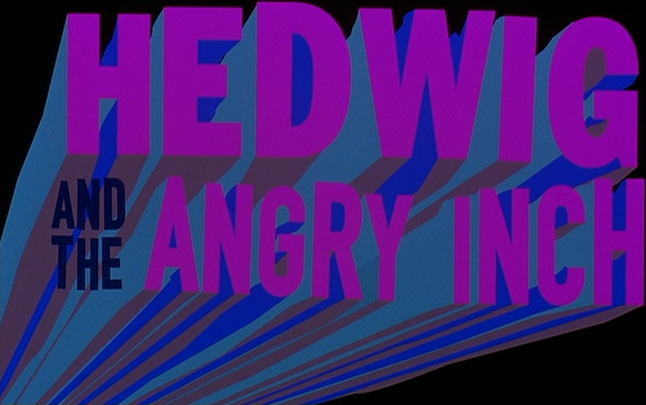 Much like Rocky Horror itself, Hedwig developed from an obscure stage play, is centered around a transvestite (or possibly transsexual) figure, developed a cult-like following in the theater, spawned a movie version, and has since inspired midnight showings in many areas complete with audience participation and (occasionally) shadowcasts. Get Hed! Dramatists Play Service, Inc. - Handles the performance rights for stage productions of Hedwig and the Angry Inch. Hedwig and the Angry Inch (2006 Australian Cast) - Featuring iOTA as Hedwig. Hedwig in a Box - Celebrating Hedwig and the Angry Inch. The Long Grift by They Might Be Giants - 2 minutes 57 seconds (320x240, 30 fps, 6.7 MB). They Might Be Giants perform The Long Grift from Hedwig and the Angry Inch, for the 2003 "Wig In A Box" tribute album. In this video, the Deeply Felt Puppet Theater appears as "They Might Be Puppets". Wig In A Box (2004-03-13) by Bockman's Euphio - 6:06, 239 kbps MP3, 10.4 MB (32.4 MB lossless FLAC also available). Live at Cicero's in St. Louis, Missouri on March 13th, 2004. Taken from The Internet Archive. Wig In A Box (2004-03-27) by Bockman's Euphio - 5:47, 231 kbps MP3, 9.5 MB (29.9 MB lossless FLAC also available). Live at Chester's Place in Fayetteville, Arkansas on March 27th, 2004. Taken from The Internet Archive. Wig In A Box (2004-04-11) by Bockman's Euphio - 5:56, 222 kbps MP3, 9.4 MB (31.4 MB lossless FLAC also available). Live at Dulcinea's 100th Monkey in Denver, Colorado on April 11th, 2004. Taken from The Internet Archive. Wig In A Box (2004-04-17) by Bockman's Euphio - 6:23, 226 kbps MP3, 10.3 MB (34.5 MB lossless FLAC also available). Live at Cervantes' Masterpiece in Denver, Colorado on April 17th, 2004. Taken from The Internet Archive. Wig In A Box (2004-07-24) by Bockman's Euphio - 6:20, 226 kbps MP3, 10.2 MB (32.8 MB lossless FLAC also available). Live at The Blue Note in Columbia, Missouri on July 24th, 2004. Taken from The Internet Archive. Wig In A Box (2005-05-05) by Bockman's Euphio - 7:09, 241 kbps MP3, 12.3 MB (38.1 MB lossless FLAC also available). Live at The Setlist in Warrensburg, Missouri on May 5th, 2005. Taken from The Internet Archive. Wig In A Box (2006-01-21) by Bockman's Euphio - 6:59, 242 kbps MP3, 12.1 MB (41.0 MB lossless FLAC also available). Live at The Blue Fugue in Columbia, Missouri on January 21st, 2006. Taken from The Internet Archive. Wig In A Box (2006-11-25) by Bockman's Euphio - 7:11, 238 kbps 48.0kHz MP3, 12.2 MB (83.0 MB lossless FLAC also available). Live at Cicero's in St. Louis, Missouri on November 25th, 2006. Taken from The Internet Archive. Wicked Little Town (2004-04-11) by Bockman's Euphio - 4:10, 222 kbps MP3, 6.6 MB (21.5 MB lossless FLAC also available). Live at Dulcinea's 100th Monkey in Denver, Colorado on April 11th, 2004. Taken from The Internet Archive.